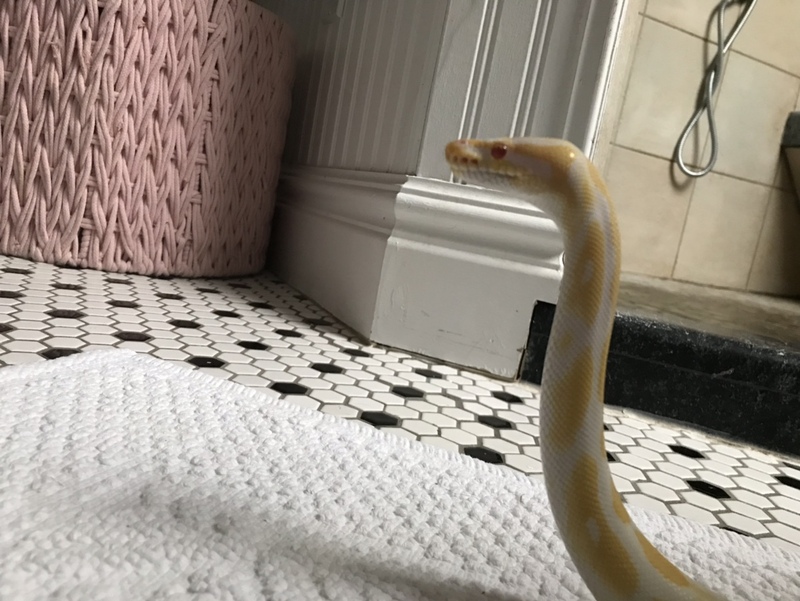 Thread: Is my snake just awkward, or??? Is it just me or do ball pythons get bashful at times? Kaa is usually a pretty aggressive feeder, but she missed a strike a few weeks ago and has been weird about attempting to feed since then. She hasn’t even struck for two weeks and now this third time she grabbed and let go of the mouse twice. The first time because it was in her water dish (which she usually aggressively drags her prey out of) and the second time she worked for about 5 minutes to line the head up for swallowing, couldn’t get it, and gave up. She has very seldom been interested in striking a second time if she misses the first one and always gets a little ‘awkward,’ but usually she’s pretty quick to strike at the next feeding, although she’s often noticeably more hesitant. She’s about 3 years old. 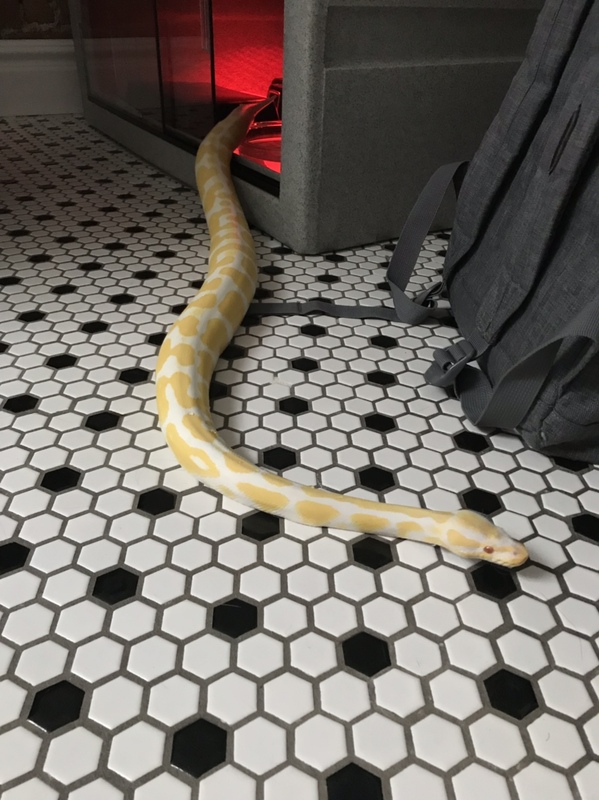 Does anyone else’s snake do this? Nothing has changed, and the week before the failed strike she pounded two jumbo mice days apart like her life depending on it. Even now, she’s rearing up and waiting at the glass as I prepare the meal, but just isn’t following through. It frustrates and worries me, although she seems perfectly fine. I’m just wanting her to eat something because it’ll be hitting the 4 week mark when I try feeding her again. She’s in her favorite place right now, on the floor of a heated bathroom. Humidity is in the upper 40s, ambient temp. cool side reads upper 70s to low 80s, and the ambient of the warm side is in the mid 80s-90s. She spends 95% of her time under the cool hide which is typical of her, but has 3 hides that are exactly the same to choose from in different areas around the tank. She’s pretty sociable and likes to come out and stare at our cats, myself, or others when we enter the room. Usually this is a hint she’d like to eat, but right now she’s being a weirdo. I’ve attached a couple photos after her failed feed patrolling her home (actually, she was testing that I’d properly locked her doors and she couldn’t escape). She’s in a V332 for size reference. Is she just quirky? Any suggestions? 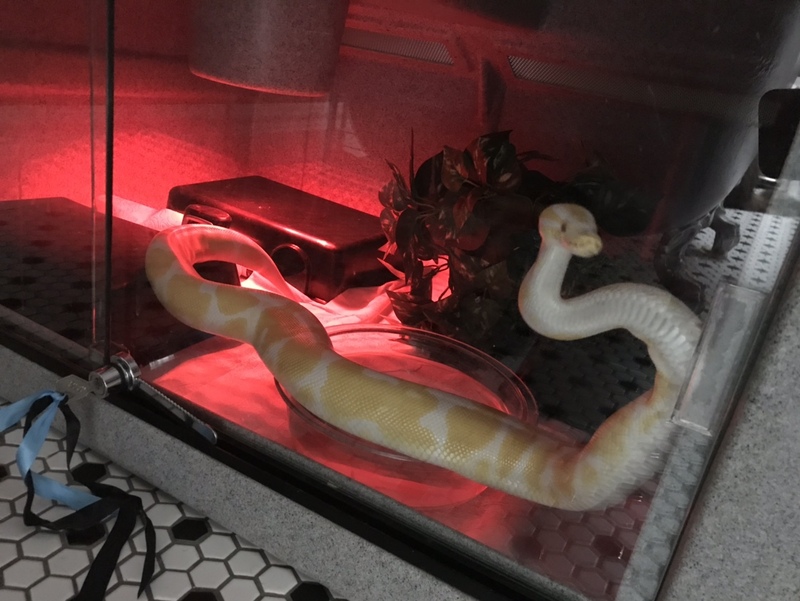 Re: Is my snake just awkward, or??? your humidity is way too low; aim for 60%. temps also seem on the low end all around. regarding your questions: my shyest eater has absolutely gotten "embarrased" after a missed strike and gave up. he doesn't miss often but this scenario has happened to us before. regarding regular missed strikes: are you heating the feeder properly? focus the heat on the head more than the body? EDIT: your noodle looks stunning btw! Last edited by tttaylorrr; 04-13-2019 at 12:20 PM. It’s so dry here the humidity is a constant issue, unfortunately. I forgot to add that I put moss under the warm hide that I wet often so she has a humid hide for when she sheds. She hasn’t had a problem with any sheds, but I think I’ll try putting a humidifier in the room somewhat near her and see what that does. I’ve tried several other methods and the humidity is still awful. I agree it wouldn’t hurt to be warmer. She typically eats like a pig under the current temps, although it’s winter now and that’s why they’re on the lower end of the spectrum. The heat has been a slight problem this winter. This is the first winter she’s been in this V332 cage as well. She was in glass tanks before and I had an easier time keeping them warm. I can get a space heater or something to try to warm the room when I’m home. Bad idea?? The current house is extremely old and this is the warmest place in it due to the heated flooring. She’ll be moving with me to an apartment soon which will hopefully be more consistent... and better insulated. I’ve thought about adding a radiant heat panel, but would prefer not to have to drill holes into her cage. I’m open to suggestions or recommendations on alternative methods! Something that I can attach to an inner or outer side wall would be ideal due to the construction of this cage. Yeah, the mouse is definitely heated well. I stick it under the heat lamp about 3-5 min each side after it’s thawed. I’ll try positioning it so the head is more centered and see if that helps. She doesn’t miss too often, I think sometimes it’s half my fault because my hand shakes and I pull the mouse a millimeter to the side and she’s already slightly veered off course. She’s also just smashed straight into the glass a couple times or hits the mice so hard they explode so I think some it might be overexcitement. 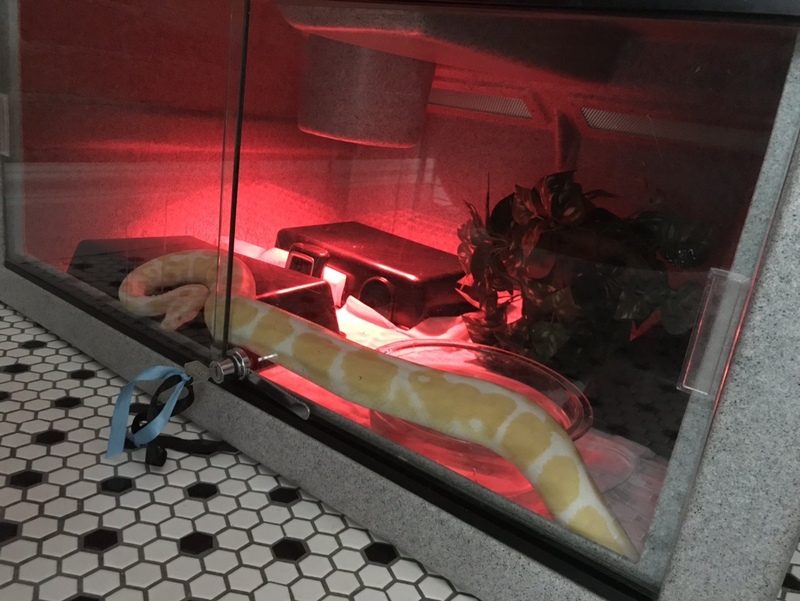 She’ll slither right out of the tank to grab stuff if I’m not fast enough sometimes. She’s very hard to predict though because there are times she gingerly grabs the mouse or strikes straight from her hide without me seeing her gearing up beforehand. She’ll usually go a long stretch without missing - months can go by, but then something happens and she’ll epically miss and get cagey. Good to know she’s not the only awkward one out there. Both of my BPs will go through phases where they are more careful/ slower when striking. Sometimes they don't strike at all and just slowly start eating. They are just kinda goofy sometimes. How long does it usually take them to get back on track? I don’t have the feeling sea going to starve to death, but I’d prefer she eats.